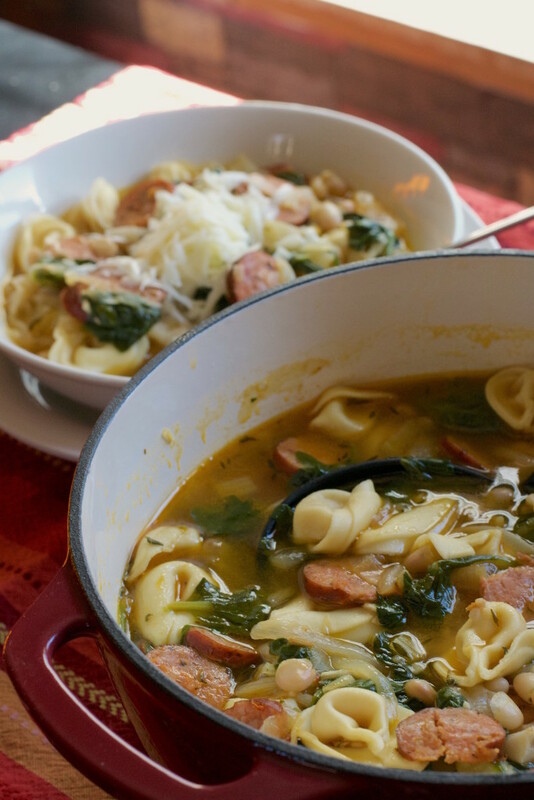 White Bean Sausage Tortellini Soup - What the Forks for Dinner? 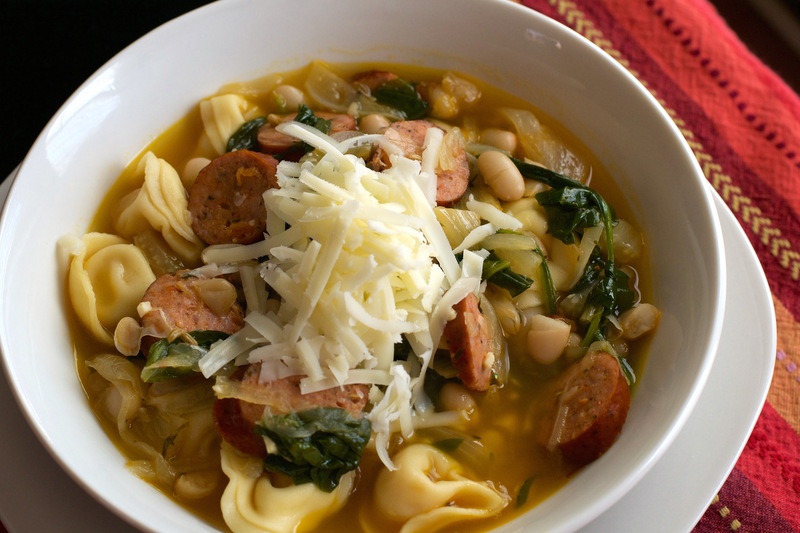 Sunday was soup day…..White Bean Sausage Tortellini Soup! Tim and I are of the Mexican or Italian taste palette. This time it’s Italian……Molto bene (very good)……ok, I don’t know Italian, so I looked it up! Funny how something with simple ingredients can come together and be awesome. Precooked sausage…….Oscar Meyer has an Italian Herb flavor that I really think made this soup. Any precooked sausage or Polska Kielbasa will do. Onions are a base for almost all soups, but for this dish I added some fennel …….lesson time……. Fennel plants have leaves that remind me of dill and you can eat the “fronds”…..thats what the dill looking part is called. Not only can you eat the leaves, but the seeds and bulbs as well. Fennel looks kind of like a cross between an onion and the base of a bunch of celery and has a sweet anise-like flavor. But it doesn’t taste like licorice… it is a light, bright spring-like flavor. Plus, fennel is good for you, it contains Vitamins A and C, as well as potassium and calcium. Garlic, which no respectable Italian dish is without….just saying, a pinch of red pepper, gotta have a touch of heat….some chicken stock……please use stock, you will get a much better flavor. I added a can of white kidney beans….a.k.a. Cannellini beans and spinach for greens. 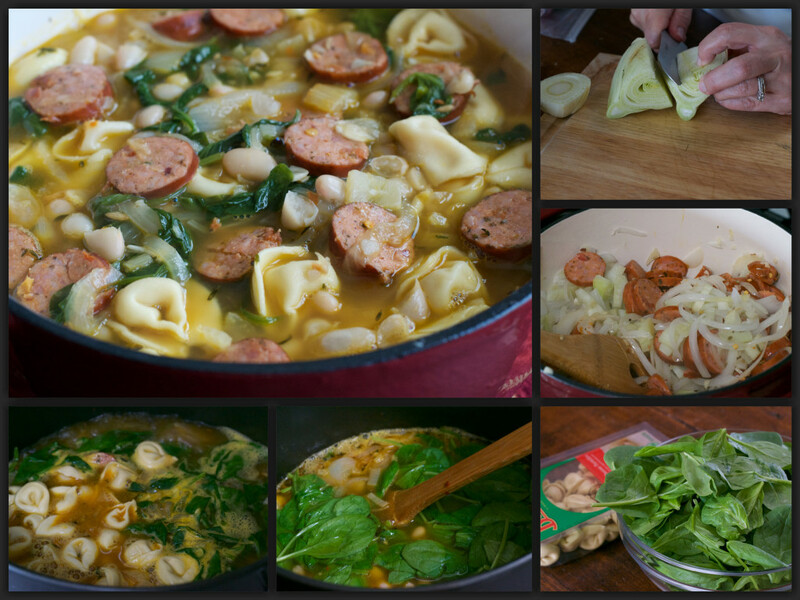 OMG….I almost forgot the tortellini……hard to make White Bean Sausage Tortellini Soup without it. Silly me…. The whole thing takes all of 30 minutes……who doesn’t have 30 minutes?????? 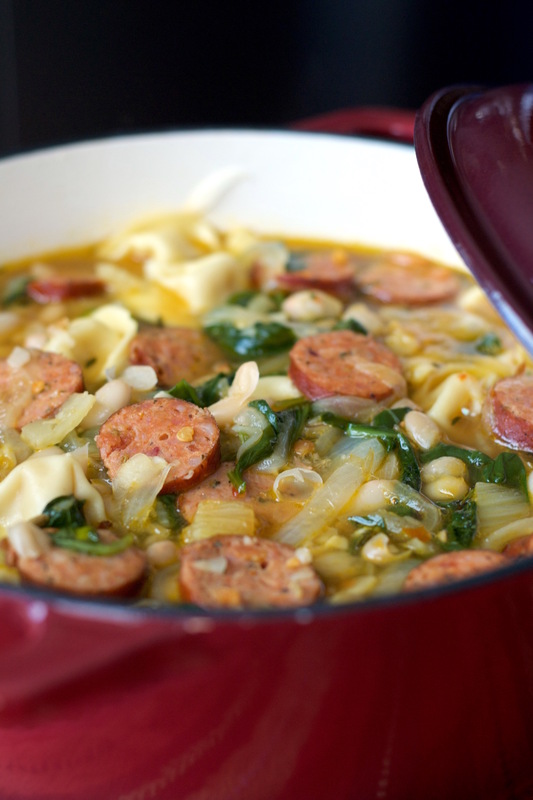 30 minutes to an incredible, warm , hearty soup…….White Bean Sausage Tortellini Soup. Serve it with asiago or parmesan cheese and some crusty bread….delicious!!!!!!!!! Heat oil in heavy large pot over medium-high heat. Add next 7 ingredients. Sauté until vegetables are soft and kielbasa is brown, about 12 minutes. Add stock and bring to boil. Stir in spinach and beans. Reduce heat and simmer until spinach is wilted, about 4 minutes. 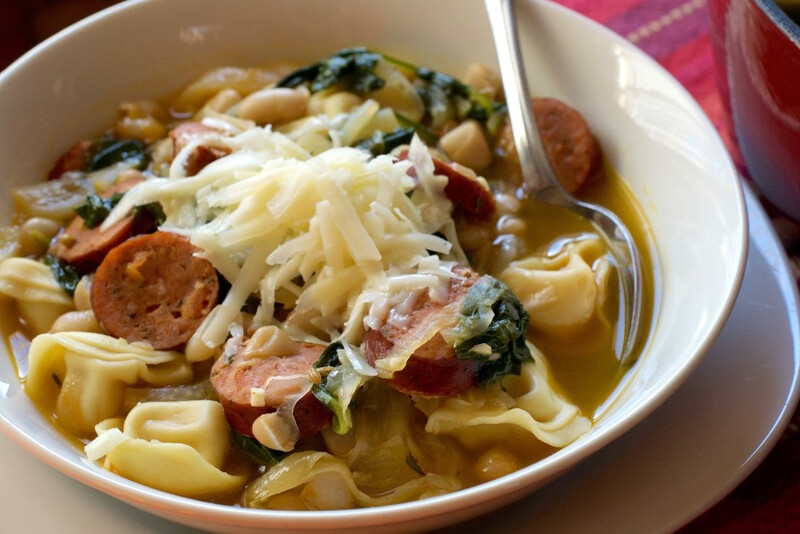 Add tortellini to soup. Simmer until pasta is al dente, about 5-7 minutes. Ladle soup into bowls. Sprinkle with asiago cheese.